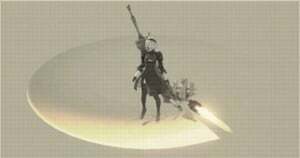 R040: Blade is a Pod Program in Nier: Automata. Spins a Pod around the player at high speed, wreaking havoc on any enemies it touches. Spawns a blow-torch-like blade that spins around the player; damaging every enemy they hit. Charging with more pods increases the number of blades. Provides a semi-reliable barrier against all projectiles because it counts as a melee attack. R040: Blade is quite damaging but pod fire is disabled while active.